Study: Diet May Help ADHD Kids More Than Drugs Kids with attention deficit hyperactivity disorder can be restless, impulsive, inattentive and difficult to handle. Many are treated with drugs, but a new study suggests that food may be the key. The study's author says a very restrictive diet can significantly reduce symptoms. Hyperactivity. Fidgeting. Inattention. Impulsivity. If your child has one or more of these qualities on a regular basis, you may be told that he or she has attention deficit hyperactivity disorder. If so, they'd be among about 10 percent of children in the United States. Kids with ADHD can be restless and difficult to handle. Many of them are treated with drugs, but a new study says food may be the key. Published in The Lancet journal, the study suggests that with a very restrictive diet, kids with ADHD could experience a significant reduction in symptoms. The study's lead author, Dr. Lidy Pelsser of the ADHD Research Centre in the Netherlands, writes in The Lancet that the disorder is triggered in many cases by external factors — and those can be treated through changes to one's environment. "ADHD, it's just a couple of symptoms — it's not a disease," the Dutch researcher tells All Things Considered weekend host Guy Raz. The way we think about — and treat — these behaviors is wrong, Pelsser says. "There is a paradigm shift needed. If a child is diagnosed ADHD, we should say, 'OK, we have got those symptoms, now let's start looking for a cause.' "
Pelsser compares ADHD to eczema. "The skin is affected, but a lot of people get eczema because of a latex allergy or because they are eating a pineapple or strawberries." 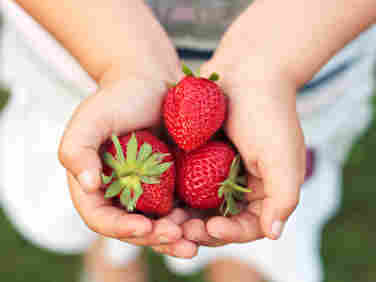 According to Pelsser, 64 percent of children diagnosed with ADHD are actually experiencing a hypersensitivity to food. Researchers determined that by starting kids on a very elaborate diet, then restricting it over a few weeks' time. "It's only five weeks," Pelsser says. "If it is the diet, then we start to find out which foods are causing the problems." Teachers and doctors who worked with children in the study reported marked changes in behavior. "In fact, they were flabbergasted," Pelsser says. "After the diet, they were just normal children with normal behavior," she says. No longer were they easily distracted or forgetful, and the temper tantrums subsided. Some teachers said they never thought it would work, Pelsser says. "It was so strange," she says, "that a diet would change the behavior of a child as thoroughly as they saw it. It was a miracle, a teacher said." But diet is not the solution for all children with ADHD, Pelsser cautions. "In all children, we should start with diet research," she says. If a child's behavior doesn't change, then drugs may still be necessary. "But now we are giving them all drugs, and I think that's a huge mistake," she says. Also, Pelsser warns, altering your child's diet without a doctor's supervision is inadvisable. "We have got good news — that food is the main cause of ADHD," she says. "We've got bad news — that we have to train physicians to monitor this procedure because it cannot be done by a physician who is not trained."